One of the great challenges of the sport of triathlon is balancing experience, expertise and fitness across three individual sports, then combining them into a single, three sport event. The swim can cause anxiety even for the seasoned triathlete. Keep working on your weaknesses; turn them into strengths to grow your fitness, competence and confidence. Refine your freestyle technique. Even Olympians do drills. The swim is highly technique driven and it’s important to continue to work to improve in this area in order to get faster and stronger. The pull is your main propulsive force, but the kick is often neglected by triathletes in order to “save their legs” for the bike and run. Good logic, but if you don’t train your kick, you lose about 15-20% of your propulsion. The loss of efficiency and coordination between your kick, hips/core and pull will prevent further improvements. Once you’ve improved your kick, you can use it or not use it as needed. If you lack efficiency, endless yards in the pool will only get you so far. Fingertips enter the water in line with your ear, elbow slightly bent, shoulder internally rotated. Hip rotates down toward the bottom, giving you more length as you extend your arm in front of you. With your arm fully extended begin to press down on the water with your lat muscles, fingertips aim towards the bottom as elbow pushes forward to “catch” the water. Think of reaching “over a barrel”. Elbow is about six inches under the water at this point. The press down on the water is brief and translates quickly to pushing the water back, palm facing the wall behind you. Finish with a brush of your hand past your thigh. Recovery is a relaxed rotation of your arm/shoulder in line with your hips to prepare for the next stroke. Video analysis. This is one of the most powerful ways to be able to look at what you’re actually doing in the water (vs. what it “feels” like you’re doing in the water). 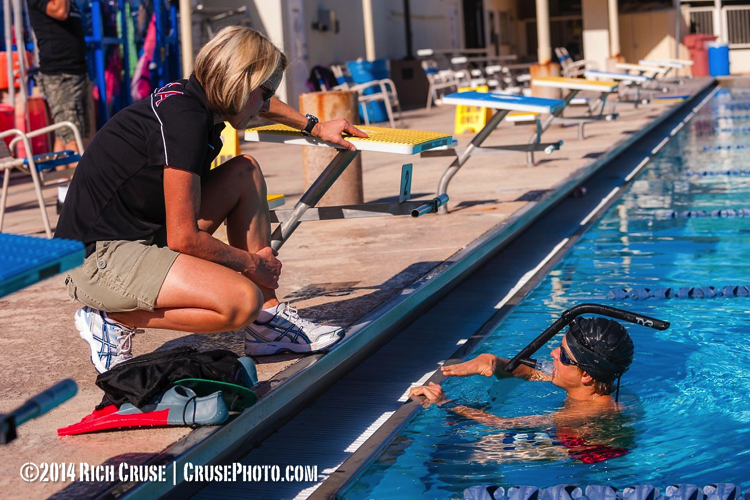 Getting expert eyes on your stroke pays strong dividends. You can see in real time what’s working and what’s not working correctly in your stroke. Not all drills are appropriate for all swimmers. Learn individual technique pointers and drills specific to your needs to improve both efficiency and fitness.